Free Scrap Car Removal, Vehicle disposal Silverdale & Orewa Buying�Vehicle from 1985 To 2015 in Any Conditions Dead or Alive! is located in Auckland�and pay cash for cars, utes, vans, trucks, 4wds. 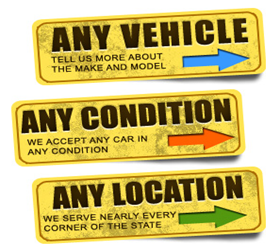 If the car is damaged, scrap, accident, old or new we remove them all and give you free of charge removal. call us on 0800 227 973 Today to have your vehicle cashed out. Car Wreckers Pick Up Cars From Any Auckland Suburbs!! Cash for Cars Wreckers�Silverdale Orewa�� Cash For Cars Auckland removes cars from any�Suburbs�Auckland wide. www.carwreckers.co.nz is a professional and licensed car removal company based in Auckland. Cash for Cars Wreckers�Silverdale, Orewa�� Cash For Cars Auckland has over 10 Years experience in car removals industry and�leading in the car removal industry. ANZ Car Wreckers provide a dedicated friendly 24/7 service�Auckland wide. Cash for Cars Wreckers Pukekohe�aim to make the process of selling your car as easy and straight forward as possible in a professional and friendly manner. From 1985 To 2015 any condition!! Toyota, Nissan, Mitsubishi, Honda,� Suzuki, Mazda, Isuzu, Audi, Renault, BMW, Chevrolet, Ford, Hyundai, Jeep, Kia, Land Rover, Mercedes, Volkswagen Volvo, Nissan, Fiat, Chrysler, Holden, Peugeot, Scania, Canter, Fuso vehicle we are buying for cash today. Check out our Toyota�wreckers page today�page for more details. Cash for Cars, Car�Wreckers�Silverdale and Orewa� listens to your problems with care. Our professionals are dedicated in �removing old, unwanted, accident, scrap cars. We pride on our reputation and there is no hidden charges when you call Cash for Cars Wreckers Silverdale Orewa Auckland.